Brenda and Wayne McAlaster of Warman, SK, have always supported animal adoption, so they attended an animal welfare fundraiser, which included a silent auction. One of the items had been donated by New Hope Dog Rescue in Saskatoon – and the couple bought it. Read Holly’s story in Brenda’s words. Now aware of the rescue, they began looked at its site on the web. They had lost their dog, Pal, due to an illness and really didn’t want to go through that devastating loss again, but looking at adoptable pets constantly reminded them just how many dogs were in need. Holly wasn’t a “perfect” dog. 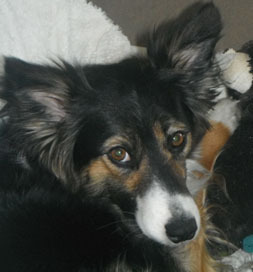 The Border Collie mix had a constant twitch in her right leg that limited its use. The twitch also affected her muzzle. A vet couldn’t determine the cause but suggested she might have been a distemper survivor or perhaps her problem was due to a trauma to her shoulder. But while the twitch might bother some folks, it didn’t bother the McAlasters, even given that she would require ongoing therapy. They adopted her. ‘”Once in a while she shows a glimpse of who she once was,” Brenda says. “She will bound across the room to grab a ball, but stops dead and looks at you, as if she is saying, Can I? Should I? Am I able to? Then she goes and lies down. Holly has lucked out because the McAlasters don’t see her twitch as any big deal. “We don’t consider her disabled … gimpy … handicapped,” Brenda says, “we consider her ours.” After all, she’s family.